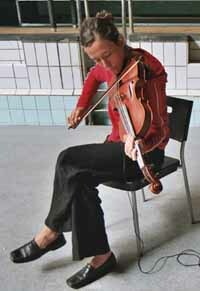 Julia Eckhardt studied viola in Rotterdam and Brussels. She worked with several chamber music ensembles, especially in Berlin and Brussels such as Berliner Kammeroper, Neuköllner Kammeroper, Freies Kammerorchester, Champ d’Action, ensemble Musiques Nouvelles, Wandelweiser Komponistenensemble, etc. From 1996 till 2002 she was a member of the the National Orchestra of Belgium. Since 1996 she is artistic responsible for Q-O2 (ensemble for contemporary experimental and improvised music). The ensemble worked with composers such as Pauline Oliveros, Phill Niblock, Stefan Van Eycken, Jennifer Walshe, Christian Wolff. Since 2001, Eckhardt is a member of Incidental Music, an international ensemble for conceptual music that works projectwise. In 2000 she also began playing improvised music and worked with Stevie Wishart, Jim Denley, Burkhard Beins, Lucio Capece, Anthony Coleman, Robin Hayward, Rhodri Davies.